A few months ago I wrote about Simeon “S.R” Clay on this blog. From that point on I wondered what had happened to Simeon. As we know he graduated from Meharry in 1899 and moved back to Ripley, TN. I found a US Census entry for him on the 1900 census, but had been unable to locate him on any further censuses. Well I found SR Clay and his family. While reviewing old photographs that I had taken of Canfield Cemetery in Ripley I came across a photo of his tombstone. He and his wife Mintie both passed in 1906 according to their tombstone, just six years after they had moved back to Ripley. What happened to them? The State of Tennessee did not require the completion of death certificates until 1908. I then began to look for their children. I easily found his daughter Nannie on the 1920 Census. She was listed as living alone in Ripley, TN. She was the head of her household and she owned her home. She also worked as a teacher in the public school. According to the tombstone she passed in 1924. 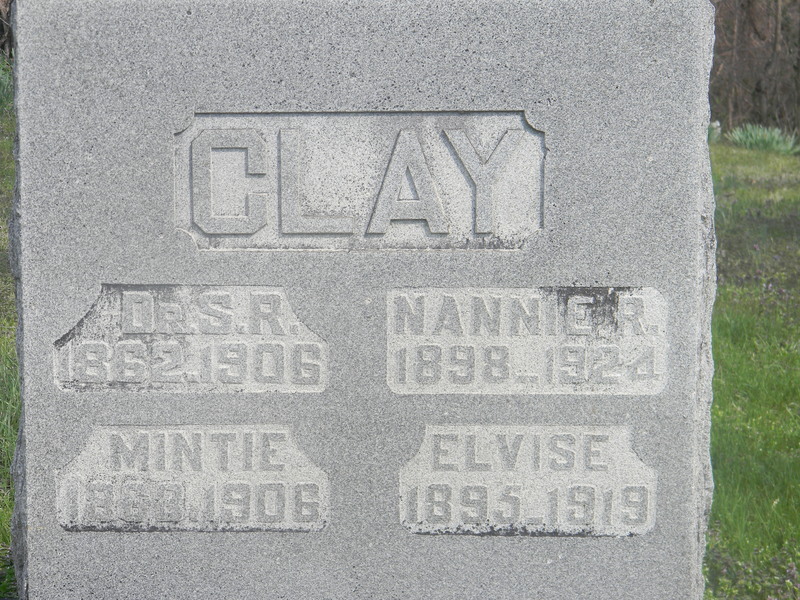 SR Clay’s daughter Elvise died in 1919 according to the tombstone. I have not yet been able to locate any records on her. Year: 1920;Census Place: Ripley, Lauderdale, Tennessee; Roll: T625_1751; Page: 16A; Enumeration District: 94; Image: 685.